Copyright laws, along with other Intellectual Property Rights (IPRs), constitute the legal foundation for the "global knowledge-based economy" and copyright law now plays an increasingly important role in the creation of business fortunes, the access to and dissemination of knowledge, and human development in general. 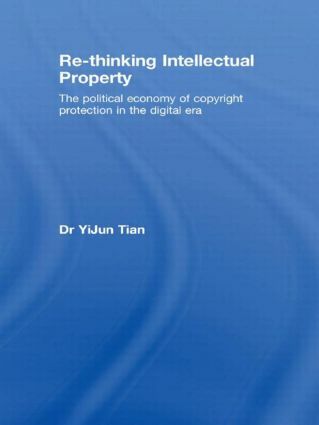 This book examines major problems in the current IPR regime, particularly the copyright regime, in the context of digitization, knowledge economy, and globalization. The book contends that the final goals of IP law and policy-making are to enhance the progress of science and economic development, and the use and even-distribution of intellectual resource at the global level. By referring to major international IP consensus, recent developments in regional IP forums and the successful experiences of various countries, YiJun Tian is able to provide specific theoretical, policy and legislative suggestions for addressing current copyright challenges. The book contends that each nation should strengthen the coordination of its IP protection and development strategies, adopt a more systematic and heterogeneous approach, and make IP theory, policy, specific legal mechanisms, marketing forces and all other available measures work collectively to deal with digital challenges and in a way that contributes to the establishment of a knowledge equilibrium international society.